With two Oscar nominations under his belt for his latest collaboration with director Edgar Wright, Baby Driver, one for sound editing and the other for sound mixing, engineer Julian Slater is already having a great 2018. The spotlight on his career is something he never imagined because of the nature of his job ("I've never had a brush with the Academy and then I get two nominations at once," he says, adding, "it's been quite a crazy couple of weeks") but the sonically robust Baby Driver has brought sound editing and mixing into the forefront of how we experience watching movies. But what's the difference between sound editing and mixing? Every year, movie-going laymen ask the question at their Oscar parties, and every year, someone forgets to look up the answer before the ceremony begins. With the opportunity to chat with Slater about the multiple roles he played in executing Baby Driver’s extraordinary soundscape, his long-time working relationship with Wright, and the difference between being a sound designer, a sound editor, and a sound mixer, we jumped at the chance to start with one of the Academy Awards' most mystifying aspects. Thrillist: Some groundwork: What's the difference between a sound editor and a sound mixer? Julian Slater: If you take for example on Baby Driver, I actually wear three hats. I have three titles. Supervising sound editor, which means I run the team of other sound editors. I'm kind of the conduit between Edgar and the team around me. It's my responsibility to deliver the sound on budget; that's the first responsibility to the producers. And then also to give the director, at the very least, what it is that they're envisioning for their movie, and hopefully to push it on past that and to exceed what their expectations are. So that's the supervising sound editor part. The sound designer is the person who then comes up with some weird and wonderful noises and tries to manipulate sounds, tries and comes up with sounds that haven't been heard of before. That's the sound designer, and even that term “sound designer” can encapsulate a few different things. But that's essentially what a sound designer does. Coming up with new and wonderful and unique sounds, hopefully. Sound mixer is a person who sits a mixing board with all those faders and then spends weeks blending all those sounds together into something that, hopefully, the audience appreciates. Doesn't struggle to hear the dialogue or the words. Isn't too loud that they get annoyed, and hopefully helps tell the story the director is trying to do. That's a brief summary of those three roles. Let's talk about your working relationship with Edgar Wright. You guys have worked together for a long time. Slater: I'm very blessed to have Edgar as a director who works with me, because even if you count Edgar's first movie [Shaun of the Dead] and his most recent movie, those two in and of themselves, are two original and unique and genius pieces of filmmaking, let alone if you want to throw in Scott Pilgrim and Hot Fuzz and the other ones. I'm very lucky to work with Edgar, and the fact that he's very loyal. You know, he is a very loyal filmmaker. His picture editors, he's used over and over again, and his composer and his DOP. We've got to the point where there's a shorthand. I know how Edgar works, and I know that he's a bit of a machine gun of ideas. He will come to you with this, I call it a sonic playground. He sets up this infrastructure. He'll say to me, "This is the area we're going to go in." But he doesn't really concentrate on the small details, the minutiae. He hands it over to me and says, "Right, now you take it. You go off in the direction that you want to go in." Then I'll have a play and present him with an array of different ideas, and then he'll start honing them down and picking at them. It's kind of like the best way to work because he doesn't micromanage. He's thinking of the big picture, and, quite often, his big picture is something that's, in and of itself, very unique. He gets me involved pretty early on. We'll have multiple discussions before the shoot. We're not really involved in the shoot, although I will speak to the production mixer and sometimes the producer about various aspects of how things are done. Then he gets me on board very early on in the director's cut. Normally, what happens is, you have a director's cut, which takes about 10 weeks, and someone like me comes in at that point. With Edgar, I'm involved three weeks into the director's cut. He hasn't even done his first pass on the movie before I get involved. I'm in a room literally next door to him so there's the two picture editors, and then there's me. So then Edgar can come in, and we start playing with sounds at the very beginning of his editorial process. Can you describe the difference in the way that you worked on Baby Driver versus other movies that you've done? Slater: What's great about Baby Driver for someone like me is that Edgar wrote that script around the sounds of the movie. I mean, the sound of the movie is a character. So, you know, what we try to do with the overall sound of the movie is help you understand Baby's journey. Baby obviously has this hearing issue, this deficiency, this tinnitus caused by this car accident, so he listens to music the whole time. So we do a few things. Whenever Baby is not listening to music in the mix, we're hearing the tinnitus sound, which in and of itself changes depending on the environment. So sometimes it's that high-pitched whistle that you've heard in other movies. But because there's so much of it in Baby Driver, we knew that that was going to get annoying and grate on the audience. So what tinnitus is in the movie changes from scene to scene. Sometimes it's held strings. Sometimes it's brake squeals that are constant. Sometimes it's that high-pitched whistle. It gets louder in the mix as Baby gets more stressed. But it's always there whenever he's not listening to music. Likewise, when he pulls out his right earbud to talk to someone, we play the music on the left-hand side of the mix. The point of what we're trying to do is pull the audience through this story. Like that first car chase sequence where everything works great for Baby and everything goes just to plan, and it's all sweet. He pulls it off, and it's like he's the best getaway driver that you've seen. But then as the story unfolds, Baby's world kind of starts collapsing in on him, and things go from bad to worse. We try and tell that story sonically as well, so that the audience hopefully, are perceiving the world through Baby's perspective. That's quite rare for someone like me, where sound is such an important part of the story. That's one aspect. Then obviously there's the whole syncopation. Most of the sounds that you hear when music is playing are happening in time with the music, whether it's police sirens or bank alarms or dog barks or gunfire or engine revs or engine skids. There's a whole kind of symphonic cacophony that's all being designed to work with the music. Normally, you know, music is kind of separate to the sound design. But with this movie, it's hopefully all perceived as one thread that goes throughout the movie. Does that make sense? In the early scene where Baby is walking down the block with coffee in hand for the crew, we hear "Harlem Shuffle," but also see visual cues lined up with the sound. There's a similar scene where "Tequila" is playing. How did that work? Slater: Yeah, there's a lot going on. I think that's kind of true for all of Edgar's movies. I can only speak for my portion of what we did, the sound part. We did it in such a way that it was something subtle sometimes as much as it was overt. As a viewer, you can watch that movie five, six, seven, eight, nine times and you can still pick out new things. Next time you watch it, just look at that coffee run again. When he walks into that coffee shop, he walks past two workmen who are carrying a ladder. Who are walking in time to the music. Who are listening to a rap song on their radio that is in sync to the music. As he goes into the coffee shop, there is a guy on headphones sending a text message. He is listening to a music track that is in sync. He’s texting, and the send sound is in sync. When he opens up the door, the coffee shop bell is happening in sync. Let alone that he walks and he goes to speak to the barista, takes out his earbud, and the music goes over to the left-hand side of the cinema. All the coffee sounds that are happening in the background, like the coffee grinds and the banging of the grinder to get the grind out, they're all happening in sync. Now, we've deliberately done that very subtly so that it's not something that you get tired of, but it's something that even, I think, you perceive subconsciously. You just understand everything is working as one kind of form. It's been done in a way that you can go back to it three or four times and you start picking up on things. It's a multilayered movie. It sounds like it was an incredibly painstaking process for you and your team. I'm sure there were probably times when you just wanted to throw your hands up in the air and say, "Screw it." Slater: Yeah, there were. The tinnitus sound was a tough one to do because at first, it was just going to be a single sound throughout the movie. When we started playing it to people, we realized that having that ringing in your ears at the volume that we were supposed to do it, that was just going to be harsh. We tried loads of different sounds, and we still couldn't figure it out. When we hit upon the idea of changing the sound so it wasn't the same sound. You know, that time when he walks into the bank, the post office to scout out all the cameras and how many security guards there are? He goes in with Doc's nephew. The sounds there completely changes. Once we figured that out, that was like a big part. That was a nut that when that cracked, it was a big sigh of relief. It's such an integral part of the story, and yet we knew that we had to do it in such a way that was not going to distract, and only enhance the story. That was one. The other one was when his ears are blown out and essentially he's turned deaf. We need to convey that he's deaf and he cannot hear Deborah, but as an audience member, we need to hear what she's actually saying. So that was another tough one. To not hear from Baby's perspective what she's saying and what's happening around but you need to hear what she's saying. Otherwise, you're going to turn to your wife and say, "What's she saying?" That was many months of different iterations until we felt we hit upon what worked. Yeah, it really was all a challenge for different reasons. It was a bit of a puzzle, but hopefully one we cracked. Were you involved in selecting the music? Slater: Nope. I think Edgar's said in interviews, he had the idea like 20 years ago. Before he was even a filmmaker. He's had those music cues in his head for the last 10 years. I know that he would literally listen to the "Bell Bottoms" track and write the script around the track. If you listen to the lyrics... that's another thing to pick up on. If you actually listen to the lyrics of the music and see what's happening dramatically, there's another link that's going on there. He literally wrote each music cue, each scene around the music cue. This is very rare. All those music cues were cleared prior to the shoot, and we knew that those music cues were not going to change. Which was the luxury we had. Because every sound that we used in the movie we had to stretch and shrink and pitch up or pitch down to work musically. But then if that music, that whole music cue was going to change at the last minute, we'd be slightly screwed because everything that we did was dependent on that music cue. But they were locked in. We had that luxury of knowing that they were not going to change. This whole process reminds me of Phil Spector's Wall of Sound idea. Brian Wilson did it with Pet Sounds. Bruce Springsteen did it with Born to Run. Layers on layers of sound building on top of the other to create this kind of combination of music and noises. 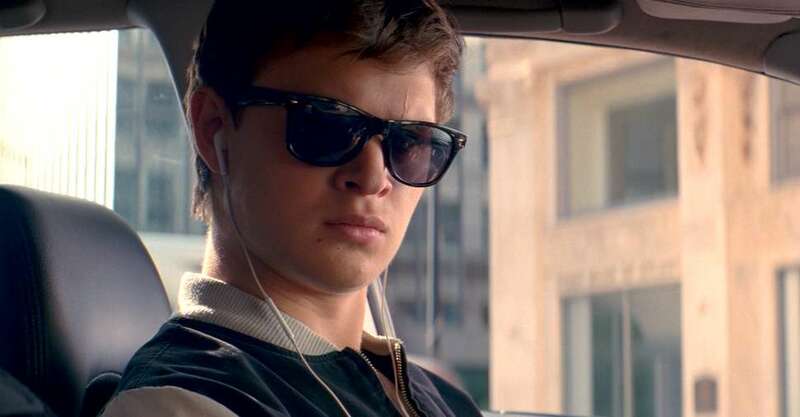 If you had to compare Baby Driver to a particular music album, what would it be? How did you originally get into sound editing? Slater: There actually were a couple of eureka moments. I remember seeing the Star Wars documentary about [sound designer] Ben Burtt, where he's got the wrench and he's tapping on the telephone wire and coming up with the sound of the blasters. That was something that I was totally blown away with. Then, if you remember, The Police had a song called "Every Little Thing She Does Is Magic." In the video of that, they're on a big mixing console. They're just mucking around and pushing on the faders. I distinctly remember looking at that, just thinking, "That looks totally cool, and I would love to do that." I was always interested in sound. I used to tape music from the radio on cassette and do my own edits, doing tape-to-tape. First I wanted to get into music production. I studied music production for a year and then got sidetracked into doing film and TV. But those two moments, seeing Ben Burtt and The Police "Every Little Thing She Does Is Magic" was definitely the catalyst for what I do today. Thanks for pulling back the curtain on Baby Driver. Slater: Thank you very much. It's just lovely that we get to talk... someone like me gets to talk about the craft because it very rarely happens. We normally spend months in a dark room. It goes out into the outside world and that's it. So to be able to explain, give a bit of insight into this kind of weird sonic world that people like me inhabit, it's good. It's good to do. Charlie Moss is a freelance writer based in Chattanooga, Tennessee. He has written for The Atlantic, The Washington Post, Slate, Vice, Paste, and other publications. Follow him on Twitter @chachimoss.